Perfect for first-time visitors to Antarctica. Travel from Argentina to Antarctica. Use Promocode XXQ10 or XXQ15 during the booking process. Tudo ocorreu como programado, com excelente atenção da equipe de expedição. 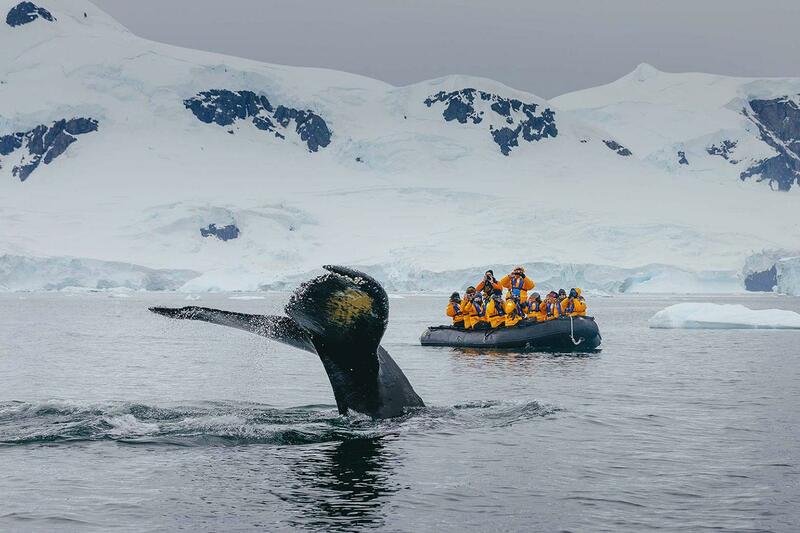 A great-value Antarctica cruise on a really comfortable ship and with a big team of Antarctica experts to enhance your experience. 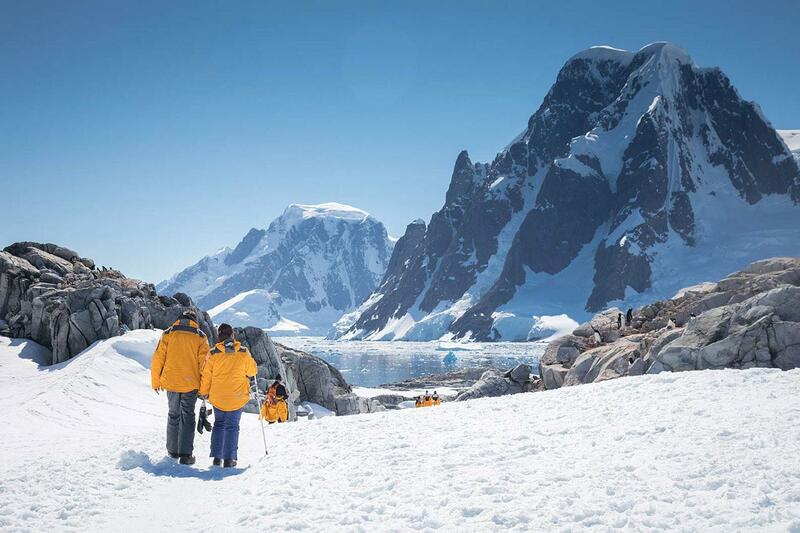 For adventure seekers, this is the perfect Antarctic trip, with adventure options such as paddling excursions, kayaking, camping, mountaineering and cross-country skiing in Antarctica. 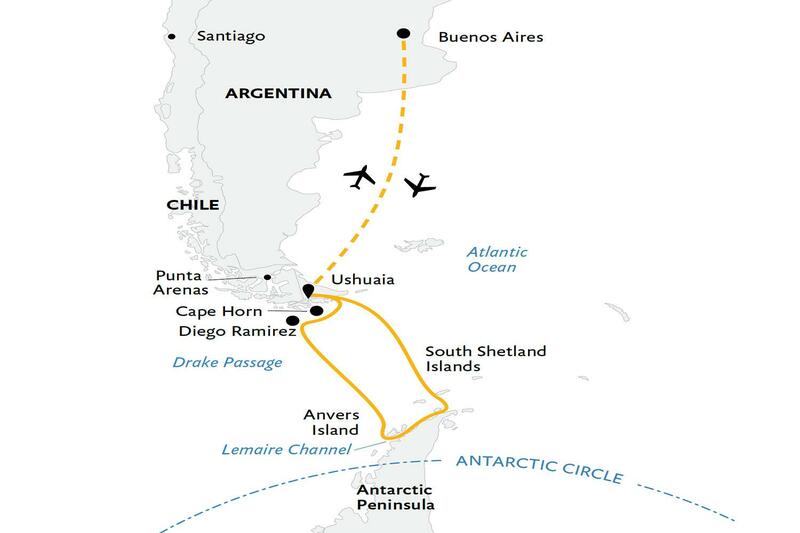 Travel from Argentina to Antarctica. 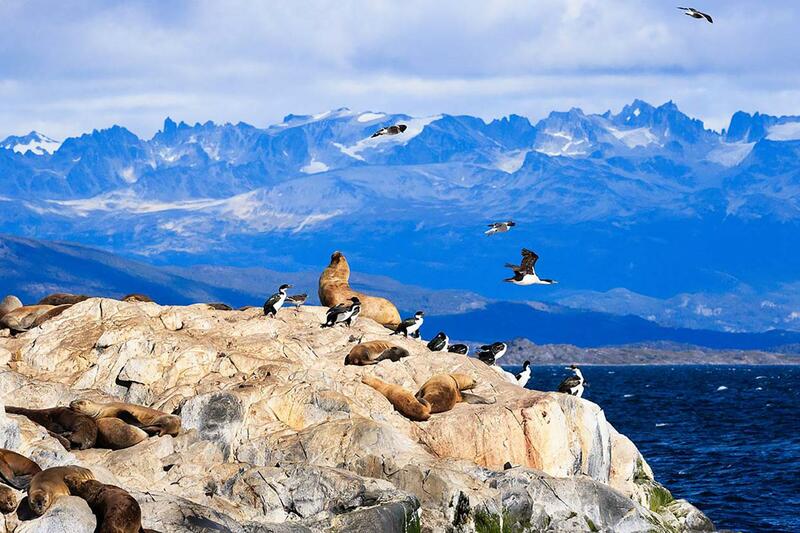 This cruise to visit Antarctica offers the best of the Antarctic Peninsula. 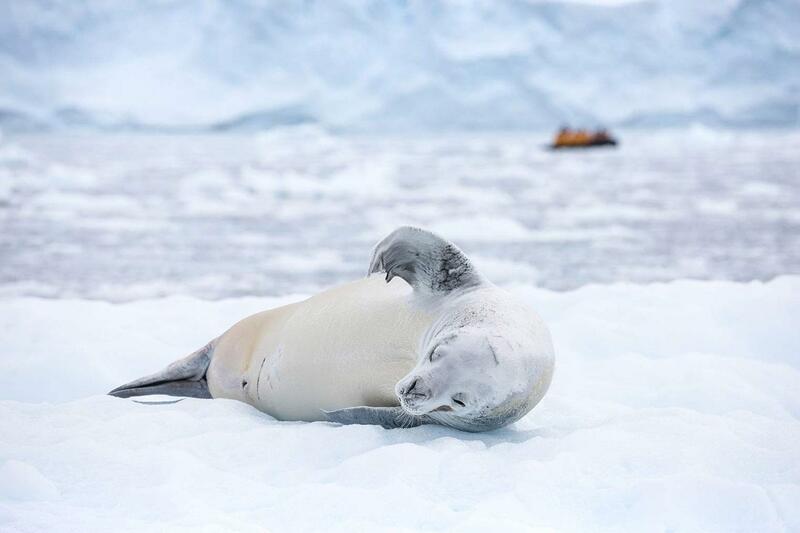 You’ll be delighted by the places to visit in Antarctica, along with Antarctica’s wildlife such as penguins, seals and whales. Cruise amongst icebergs while you explore the iconic sights of the world’s most pristine, exotic and unforgettable natural environment. Camping on Antarctica (few people have the opportunity to say they’ve camped on the 7th continent and is one of the best ways to see Antarctica in a more intimate manner). Cross-country skiing, kayaking, mountaineering and stand-up paddleboarding are some of the other incredible options. 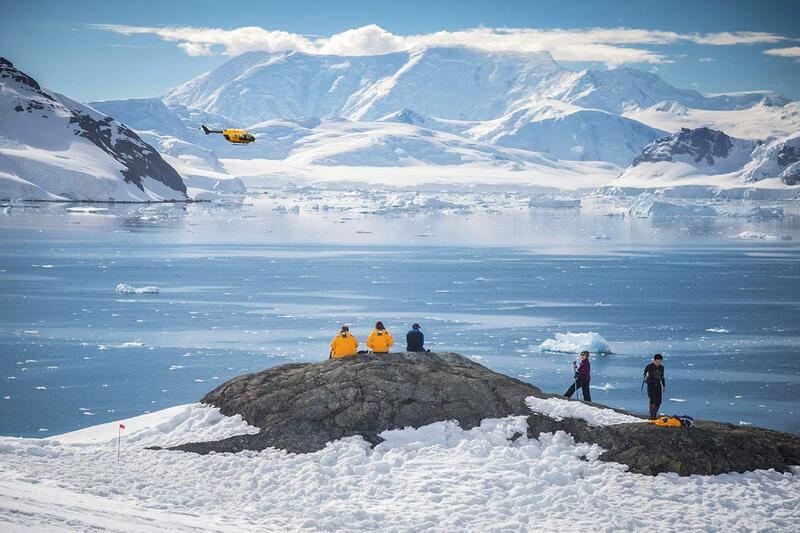 Contact us to learn more about your Antarctic adventure options. *Buenos Aires Flight and Transfer Package The Buenos Aires Flight and Transfer Package is not included in the base price of the trip - see inclusions/exclusions. Note: Some departures are 10 days and include one less day in Antarctica. Embracing the unexpected is part of the legacy – and excitement – of expedition travel. There are no guarantees that we can achieve everything we set out to accomplish. A measure of flexibility is something all of us must bring to a voyage. There are nearly 200 recognized sites in the Antarctic Peninsula and South Shetlands and the places visited may be changed from those mentioned above to others equally as interesting. POSSIBLE LANDINGS AND WILDLIFE SIGHTINGS Stepping foot on Antarctica is a moment of pleasure that affects each traveler differently. Your possible landing in Antarctica will take place on the Peninsula, which is an extension of the Transantarctic Mountains chain and is the most northern stretch of Antarctic land. Formed by uplifted submarine troughs that were filled with sediment about 220 million years ago, this is a dynamic land of both desolation and diversity. To the east is the frozen, wild Weddell Sea. To the west, howling winds and warming seas from the Southern Ocean create perfect conditions for whale sightings. CUVERVILLE ISLAND A gentoo penguin rookery is situated on a rocky beach at the north end of the island. Depending on when in the season you arrive, you may see the penguins building nests or attending to their chicks. Giant petrels and kelp gulls breed on the island. DAMOY POINT If you are lucky enough to mail a postcard in Antarctica, you’ll likely pass through Damoy Point, the northern entrance to the harbor where Port Lockroy is located. DANCO ISLAND Home to gentoo penguins, this small island is easy to explore, at only one mile (1.6 km) long. You can visit the marker of a former British Antarctic Survey hut, where you can watch for a variety of seabirds, such as snowy sheathbills, kelp gulls and blue-eyed shags. ENTERPRISE ISLAND Located in Wilhelmina Bay, this island was once used by whalers. A Zodiac cruise around the island passes a wrecked whaling ship. LEMAIRE CHANNEL You’ll see firsthand why this strait, which runs between Booth Island and the Antarctic Peninsula, is one of the most scenic locations on the peninsula’s west coast, especially during sunrise and sunset. The channel may become impassable when ice fills the narrow 6.8-mile (11 km) long passageway, so we’ll hope for clear waters. MELCHIOR ISLANDS This group of low islands in Dallmann Bay is where you may see hauled-out male fur seals as they recuperate from their battles for supremacy at the end of their breeding season. NEKO HARBOUR Little evidence remains that this bay was once used by the floating whale factory ship Neko. You might see whale vertebrae being used by resident gentoo penguins as shelter from the wind. Climb up a steep slope for spectacular views of the glacier-rimmed harbor. PETERMANN ISLAND Here, near the Lemaire Channel, you can stand ashore and see the southernmost breeding colony of gentoo penguins. 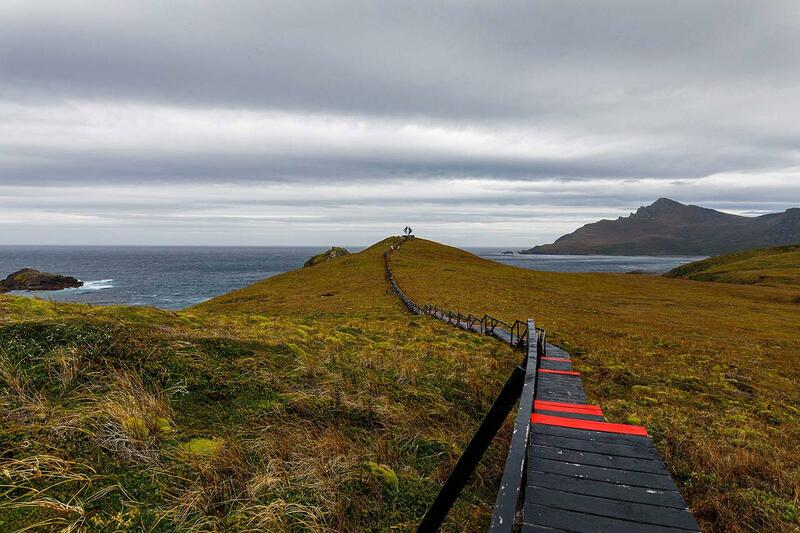 The dome of the island rises 650 feet (200 meters) above the sea, offering a challenging hike for panoramic views. Adélie penguins, shags and south polar skuas also inhabit the island. PORT LOCKROY As part of Operation Tabarin during the Second World War, a secret British base was built in this sheltered harbor, located on the west side of Wiencke Island. Now a designated historic site, the base is a museum and post office. Proceeds from your purchases in Port Lockroy support the British Antarctic Heritage trust, which preserves historic sites from the Heroic Age of Exploration. 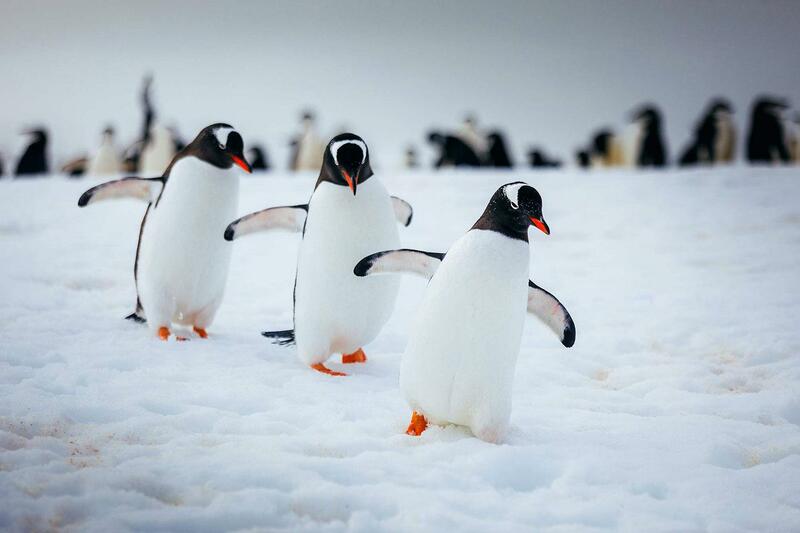 A large gentoo penguin population resides here and is observed for any effects of tourism. WATERBOAT POINT You may venture to this unique point, which at low tide is connected to the Antarctic mainland. Zodiacs are used to explore the historic area when the tide is in. Two scientists studying penguin behavior lived in a water boat on the point from 1921 to 22. The remains of their camp have been designated an Antarctic historic site. SOUTH SHETLAND ISLANDS The Bransfield Strait separates this archipelago from the Antarctic Peninsula. The South Shetland Islands stretch for 335 miles (540 km) from northeast to southwest. In the 1820s, sealers swept the islands’ beaches of seals. When the seal market collapsed, the sealers retreated. Over the course of time, seals have returned to the islands. AITCHO ISLANDS This group of small islands, some still unnamed, is situated in the northern entrance of the English Strait. You can often spot a great mix of wildlife in the area, with gentoo and chinstrap penguins having established rookeries on the islands. Southern elephant and fur seals frequently haul out here, too. BAILY HEAD Also known as Rancho Point, Bailey Head is a rocky headland on the southeastern shore of Deception Island. Chinstrap penguins build nests on slopes leading to a high ridge that dominates the natural amphitheater and provides a superb setting for landscape photography. HALF MOON ISLAND This crescent-shaped island was known to sealers as early as 1821. 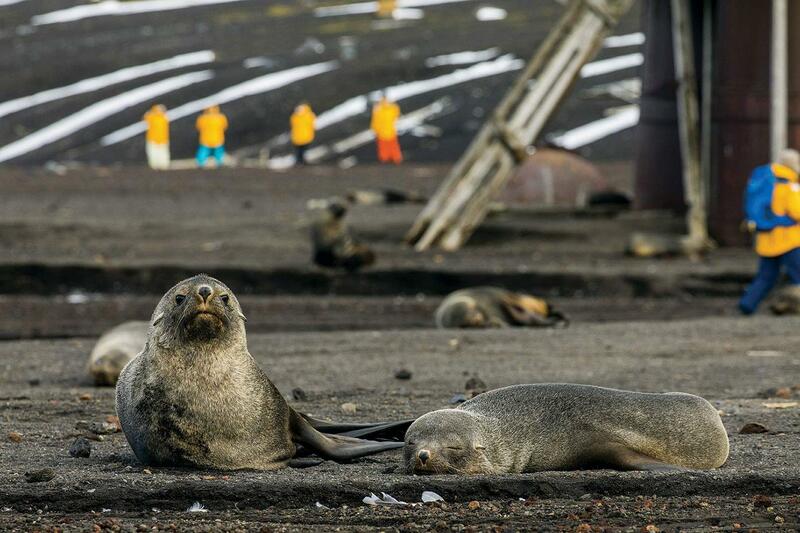 Unlike sealers, who tried to keep their best locations secret, we’re happy to bring you ashore on this impressive island. Many Antarctic birds breed here, including chinstrap penguins, shags, Wilson’s storm petrels, kelp gulls, snowy sheathbills, Antarctic terns and skua. HANNAH POINT Macaroni, chinstrap and gentoo penguin rookeries are located on this point, which is on the south coast of Livingston Island. Due to the rather congested area available to the nesting penguins, you can only visit here from January 10 onward. PENDULUM COVE Geothermal waters are found along the shoreline of this cove, named for observations made in 1829 by a British expedition. You may see yellow algae and boiled krill floating on the surface because of the scalding water! PENGUIN ISLAND Antarctica has two flowering plants, both of which you can find on Penguin Island: Deschampsia antarctica and Colobanthus quitensis. Chinstrap penguins, fur seals and southern elephant seals use the island for breeding purposes. ROBERT POINT A nice spot for Zodiac cruising, this point was known to sealers as early as 1820. Chinstrap penguins, kelp gulls and pintado petrels breed here, and whales may be seen in the surrounding waters. TELEFON BAY Your Expedition Team will be happy to point out that this is where the most recent evidence of volcanic eruption on Deception Island can be seen. TURRET POINT Chinstrap and Adélie penguin rookeries are found on this point, situated on the south coast of King George Island. The beaches here are often crowded with southern elephant, fur and Weddell seals hauling out on the rocks. WHALER’S BAY To reach Whaler’s Bay, it is necessary to sail through a narrow passage called Neptune’s Bellows. The bay was used by whalers from 1906 to 1931 and is part of a protected harbor created by the formation of the circular flooded caldera known as Deception Island. Along with waddling penguins and lounging seals, you’ll see the rusting remains of whaling operations on the beach. Watch for steam that may rise from geothermally heated springs along the shoreline. YANKEE HARBOUR Gentoo penguins have established a rookery on this harbor, situated on the southwest side of Greenwich Island. Here, you can see an abandoned Argentine refuge hut and a large glacier that stretches along the east and north sides of the bay. An abandoned sealing try pot is all that remains of the activity that brought men thousands of miles in tall ships to seek their fortune. Getting There Since air transportation to and from your voyage is not included in the cost of your expedition, you will need to arrange flights from your home to the starting point, and home again from the finishing point. Here are the details of your expedition: Arrival Day and Embarkation You may arrive Buenos Aires at any time during Day 1 of your itinerary. Upon your arrival in Buenos Aires, you will make your way to the included group hotel. That evening, an expeditions representative will greet you and be available to answer your questions at the pre-departure briefing. After breakfast the following morning, on Day 2, your group will transfer to the airport and board our private charter flight to Ushuaia, Argentina, the southernmost city in the world. Please note that there is a strict luggage limit of 20 kg (44 lbs) checked luggage and 5 kg (11 lbs) cabin baggage on the flights between Buenos Aires and Ushuaia. Should you have additional luggage, it can be stored at the hotel in Buenos Aires. There is NO option to pay for additional luggage. Upon arrival in Ushuaia (Day 2 of your itinerary), you’ll have some free time to explore this quaint port town before heading to the pier and embarking around 4 pm. Information about embarkation will be given during your pre-departure briefing at the Buenos Aires hotel. (If you are not taking the Buenos Aires flight package, you should instead arrive Ushuaia the day before the cruise starts, i.e. at any time during Day 1 of the itinerary.) Final Day and Departure The ship is scheduled to arrive back at the pier in Ushuaia between 7 am and 8 am local time. After breakfast, and once the ship has docked, you will have time to bid farewell to your Expedition Team and shipmates before completing your disembarkation. The process takes about an hour. 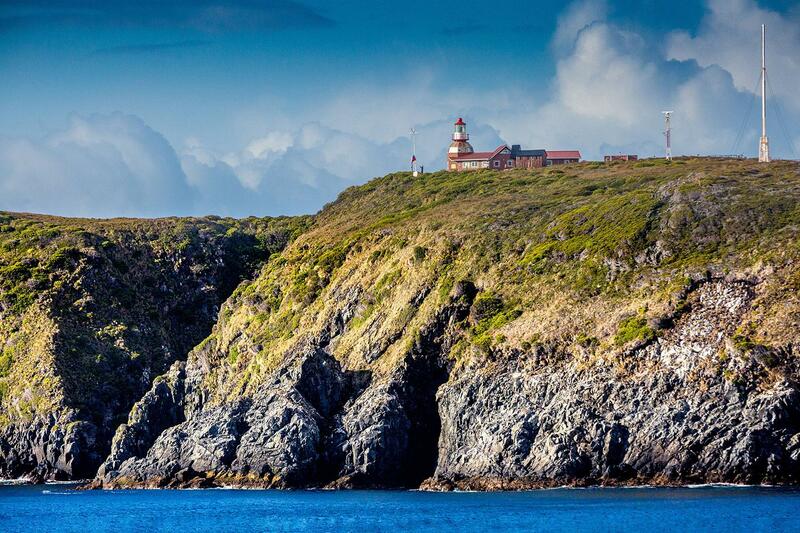 If you have purchased the Buenos Aires hotel and transfer package, we will depart the pier to take a short tour of Tierra del Fuego National Park before transferring to the airport for our return charter flight to Buenos Aires. Upon arrival in Buenos Aires, you may connect directly with your homeward flight, as we will land at the international airport (EZE). Approximate arrival time is scheduled for 5 pm. Be Flexible! Please note that weather conditions can always delay our arrival, and airline schedule changes have also been known to occur. Booking flexible tickets is always encouraged, as we cannot be held responsible for ship delays due to unforeseen circumstances. A post-expedition hotel night in Buenos Aires is recommended. The Ocean Endeavour is an extremely well-appointed expedition ship expertly engineered to explore Antarctica. Carrying up to 199 guests, the ship offers a superb guest experience with a nautical lounge, two restaurants, sundeck, and plenty of deck space for observation of polar landscapes, and lounges for learning and reflection. A pair of waterproof expedition boots on loan for shore landings. An official Quark Expeditions parka to keep. All shore landings per the daily program. Leadership throughout the voyage by experienced Expedition Leader. All Zodiac transfers and cruising per the daily program. Formal and informal presentations by Expedition Team and guest speakers. A group transfer upon disembarkation in Ushuaia from the ship to the local airport. All luggage handling aboard ship. Buenos Aires Flight and Transfer Package: Pre expedition hotel night in Buenos Aires, with breakfast, Group transfer from the hotel to the airport in Buenos Aires, Charter flight from Buenos Aires to Ushuaia (return), Group transfer from Ushuaia airport to the ship (return). Deposits Reservations require a deposit of 20% at the time you receive a booking confirmation from Expeditions Online. A payment link will be sent to you and this may be paid by major credit card or you may pay by wire transfer in your selected currency, USD, EUR, GBP, AUD or SEK. Bookings within 120 days of departure require full payment. Final Payments Balances are due 120 days prior to departure. Cancellations All requests for cancellation must be received in writing to Expeditions Online. Cancellations received 180 days or more prior to departure, are refunded less a fee of US$ 1250, AU$1600, £830, €1100 per person. If cancellation is received between 179 days and 120 days, the full deposit is forfeited. If cancellation occurs less than 120 days prior to departure, all payments are forfeited. If full payment has not yet been received, the full penalty will still apply and any unpaid balance is due immediately. We strongly recommend that you obtain adequate trip cancellation insurance. Booking Terms Please read carefully the General Booking Conditions for Expeditions Online. This voyage is operated by Quark Expeditions and you additionally travel under their terms and conditions as the operator as well as of the Shipping Company/transport carrier. Details will be forwarded to you at the time of booking.